Omnia Specialities | What are Humates? The brown coal fields of the Gippsland basin in South Eastern Victoria are the only known source of high quality humates in Australia, producing what is possibly the richest of all humates mined in the world today! These brown coals or lignite’s were formed when Australia was part of a great land mass called "Gondwanaland" some 20-50 million years ago when dinosaurs roamed the earth. In geological time this period was between the Late Eocene and Middle Miocene ages when, in waterlogged environments, plant and tree debris accumulated. As the layer of debris increased in thickness, the floors of these vast swamps subsided slowly and the plant material was decomposed by the action of micro-organisms. To varying degrees, and depending upon the climatic conditions plant constituents, including proteins, starches and cellulose were decomposed under aerobic conditions (in the presence of oxygen) by a process called “Humification”. This process results in the formation of thick layers of rich peat and humic materials. This is why some people call the brown coals of Victoria the “50 million year old compost.” As this material is covered with sediment, the combined effects of time, temperature and pressure convert the peat firstly to brown coal and then to black coals. In the transition from brown coal to black coals humate content decreases, oxygen content decreases and carbon content increases. Generally speaking, the older the coal the lower the humate content. Black coals have no humate, but the brown coals in Victoria are rich in humate being relatively young. These humate rich coals are only found in the South Eastern part of Australia in the Gippsland Basin. Within the Gippsland Basin of Victoria where these brown coals are found, there also occurs a unique geological material which has undergone natural, in situ, weathering and oxidation. This material is known as Australian Leonardite. Australian Leonardite is very similar to Leonardite from the USA although being younger and more highly oxidised it is richer in humate. The American Leonardite has often been claimed to be the benchmark standard for humic acids, until these unique oxidised coals in Australia were discovered. This Australian Leonardite is the raw material for Omnia Specialities Australia’s humate agricultural products. Determining the soluble humate and fulvate content of materials is relatively straight forward by extraction at high pH. The determination of humic acids is not so simple and the methods used can significantly influence the result obtained. Therefore it is difficult to compare claims from different companies (particularly in the USA, China and Russia) regarding the humic acid content of their products. All of Omnia Specialities Australia’s humate products are analysed according to the California Food & Drug Administration (CDFA) method to determine humic acid content. Recent independent testing of various humate liquids, using the CDFA method of analysis, showed that some products had less than 2% of the humate claimed on the label! 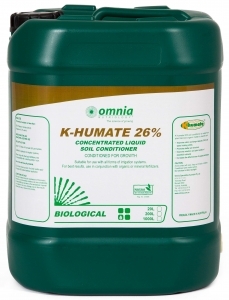 Concentrations varied from between 27.8% w/v potassium humate in Omnia’s K-humate 26% to as little as 0.33% in oppositions products. 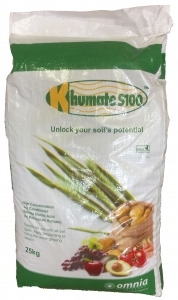 K-humate is a highly concentrated source of humic acids which is sourced and produced in Australia. The product’s high quality and proven performance is now well recognised all over the world. 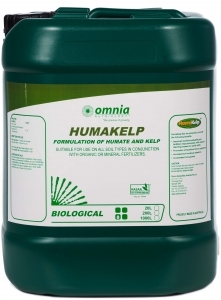 Humic acids are naturally derived from the breakdown of plant and microbial matter. Humic acids are the foundation of all fertile soils. Over the years, these humic acids accumulate in the soil to provide the soil with greater nutrient holding ability, water holding capacity, readily available carbon food source for beneficial soil micro-organisms and better soil structures. This is Nature’s way of minimising nutrient losses in order to maintain long-term soil fertility and to ensure sustainable plant growth. Humic acids present in the soil hold a wide range of micro-nutrients and macro-nutrient around plant roots to provide all the essential nutrients for quick root uptake and optimum plant growth. Humic acids also improve the wetting ability and water holding ability of the soil. K-humate provides a helping hand to farmers and growers to achieve greater crop production through a more effective use of applied fertilizers and maintaining long-term soil fertility. Soil organic matter (humus) has a great ability to hold nutrients in the soil until they are required by plants. It is the humic acid molecules in the humus which hold most of the nutrients from applied fertilizers. K-humate, with its high concentration of humic acids, greatly improves the ability of sandy soils to hold many essential nutrients such as ammonium, potassium, calcium, magnesium and the trace elements. Humic acids, which are trapped in cracks and pores and adhered to the surfaces of sand particles, hold onto many important nutrients which would have been otherwise lost to leaching. Like the saying goes, "You are what you eat". Similarly, the well being of plants depends not only on what you feed your plants, but also on the availability of the nutrients in your applied fertilizers and how successfully the plants are able to take these nutrients through their root system and foliar. K-humate soil conditioner increases the movement of calcium down the subsoil and plant root zone where it is most needed. Greater calcium concentration in the soil treated with K-humate was evident down to a depth of 16cm. This means quicker response from applied calcium in terms of nutrient availability and plant uptake. Calcium is important in promoting plant cell development which will result in healthier plants, greater resistance to diseases and better crop quality. Scientific studies have shown that a large proportion of your fertilizers are locked-up in the soil soon after application, particularly phosphates, calcium and micro-nutrients. K-humate can unlock some of the bound phosphate and micro- nutrients in the soil by chemical reactions which solubilise the fixed phosphates. Additional phosphates are also released by microbial activity brought about by the presence of K-humate. 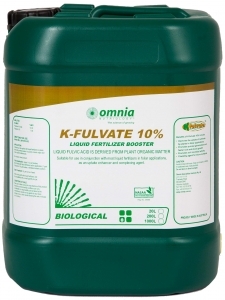 K-humate also stimulates greater root growth in seedlings and mature plants resulting in higher nutrient uptake in plants and a greater ability to tolerate extended dry spells between irrigations or rainfall. A more extensive root system growth promotes greater plant vigor and better crop yield and quality.